There is a saying that music calms the savage beast. Does that include possible alien life forms in outer space? Some of our astronauts just might think so! The US Space Shuttle ran 135 missions between its first launch in 1981 and its retirement flight in 2011. Have your students explore the aircraft, the missions and the science that occurred during the Shuttle era. Search NASA’s site for more information. Author Nathan tells us that “blowing air into her flute could have created enough force to actually send Ochoa zipping about the space shuttle cabin.” Ask your students to investigate Newton’s Laws of Motion to determine which law may have this result and how these laws could affect other instrumental opportunities in space. Can sound travel through a vacuum? Isn’t space a vacuum? What’s the deal? Watch this video, and then this one to help your students understand the science of sound in outer space. Are your students wanting more? Check out the National Geographic curated playlist on...what else? Sound! Author Nathan names a number of astronauts who have created music in space - one even composed a song he then performed. 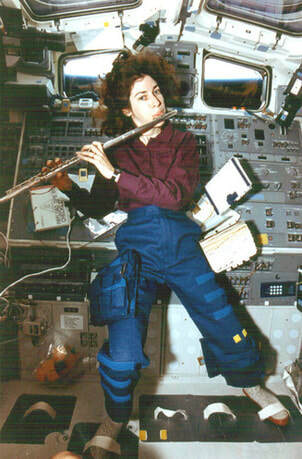 But what actually happens when you play an instrument in space? Check out this article with links to space music recordings, then ask your students to create a potential playlist for their future trip through outer space. Long before astronauts were bringing music on space voyages, composers were inspired by gazing to the stars, and movies in space have curated playlists which will be forever linked in our sound memories to the great beyond. Have your students check out space inspired music, starting with the pieces listed in this article.